The carousel at backup goalie in St. Louis continues to turn. Since the Blues lost Chad Johnson on waivers earlier this month, the team has swapped Jordan Binnington and Ville Husso several times. However, with Husso currently sidelined, it’s Binnington heading back to the AHL’s San Antonio Rampage, while first-year pro Evan Fitzpatrick gets the call to St. Louis, the team announced. Binnington has made two relief appearances this season, including just last night against the Pittsburgh Penguins. After starter Jake Allen was pulled after giving up four goals on 17 shots, Binnington surrendered two more on 13 shots. That performance may have earned him a demotion back to the minors, although the Rampage may simply need a starter today after Fitzpatrick played last night. Fitzpatrick, the Blues’ second-round pick in 2016, began the season in the ECHL and has only made two AHL appearances. However, the 20-year-old has impressed in San Antonio, allowing just two goals, which seemingly qualified him for his first NHL call-up. Whether Fitzpatrick has earned an NHL start already remains to be seen, but so far this season whoever sits behind Allen has a decent chance of seeing game action regardless. After acquiring Michael Hutchinson yesterday, the Toronto Maple Leafs have returned interim backup Kasimir Kaskisuo to the AHL’s Toronto Marlies, per CapFriendly. Forward Trevor Moore will also reportedly be joining him on the short cross-town trip back to the minor league team. Both players had been on emergency recall, but will now resume their normal AHL activities. While Kaskisuo is suffering through a miserable season and was a scary sight on the Maple Leafs roster, Moore has impressed, recording 24 points in 27 games with the Marlies and two points in three games with the Leafs. Moore will likely continue to be the next man up at forward for Toronto this season. The Los Angeles Kings announced they have assigned forward Michael Amadio to the Ontario Reign of the AHL. Amadio has been shuttling back and forth between the two teams all year. He was recalled three days ago and has already appeared in 28 games for the Kings this season, having put up two goals and four points this season. While no corresponding move has been made, it’s possible the team will be activating goaltender Jack Campbell soon as he has made one start in a conditioning stint with Ontario. The Buffalo Sabres announced they have sent goaltender Scott Wedgewood to the Rochester Americans of the AHL. Wedgewood was recalled Saturday to fill in as an emergency backup when Linus Ullmark couldn’t go. However, Ulmark was ready to go during practice today. The Edmonton Oilers announced they have recalled forward Joseph Gambardella from the Bakersfield Condors of the AHL to fill the open forward spot which the team opened up after trading Drake Caggiula to the Chicago Blackhawks. Gambardella leads the Condors with 12 goals and 21 points in 28 games. The 25-year-old has not played in an NHL game yet. Winger Logan O’Connor has received his first NHL call-up as the Avalanche announced (Twitter link) that they’ve recalled him from Colorado of the AHL. The 22-year-old is in his first professional season after spending the past three years with Denver of the NCAA. O’Connor is off to a nice start in his rookie campaign with 16 points in 29 games with the Eagles. The Buffalo Sabres have decided that goaltending is an area of need after letting Robin Lehner walk in free agency, and are expected to sign Carter Hutton to a three-year contract. Elliotte Friedman of Sportsnet also reports that the team will sign Scott Wedgewood, giving them a third option behind Hutton and Linus Ullmark. Hutton is expected to command a cap hit just under $3MM per season, while Wedgewood is on a two-way deal. Hutton, 32, is arguably the best goaltending option on the open market after another excellent season in St. Louis. The veteran netminder has plenty of experience pushing young goaltenders and supporting them when they invariably face inconsistency, and he’ll be asked to do much of the same with Ullmark in Buffalo. After posting a .931 save percentage in 32 appearances last year though, Hutton will also be asked to help lead the Sabres back into playoff contention. After finishing at the bottom of the standings once again, Buffalo will be bringing in young phenom Rasmus Dahlin on the blue line and have already acquired some help up front in Conor Sheary. Now with a solidified goaltending situation, the team is poised to find much more success in 2017-18. Wedgewood on the other hand will be asked to fill a different role for the organization. GM Jason Botterill has been very clear that he intends on building a winning organization from top to bottom, and that includes the Rochester Americans of the AHL. Wedgewood is an extremely capable minor league goaltender, who should fill Ullmark’s shoes admirably going forward. Friday: Fox Sports Midwest’s Andy Strickland reports (Twitter link) that Hutton is expected to sign with the Sabres once the free agency period officially opens up on Sunday. 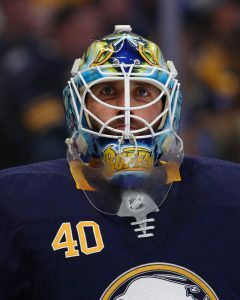 Thursday: The Buffalo Sabres made a bold move when they decided not to qualify Robin Lehner, letting their starting goaltender walk into unrestricted free agency instead of trying to fix the inconsistencies in his game. 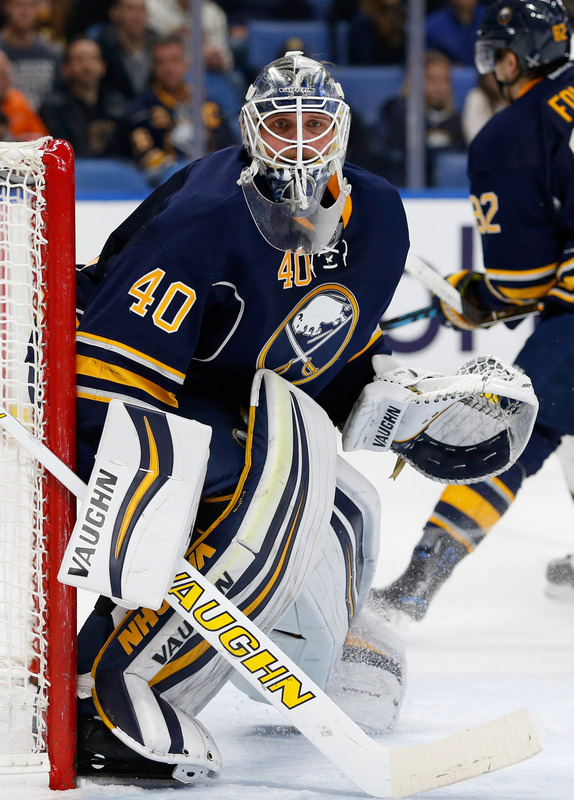 Linus Ullmark, the heir apparent to the Sabres net, will be playing a healthy number of games this season but needs some experience to help him acclimate to life in the NHL. That may come in the form of Carter Hutton, the top goaltender on the UFA market and one that brings a history of pushing young goaltenders to their full capabilities. Hutton was in Buffalo on Wednesday according to Craig Custance of The Athletic (subscription required) and has narrowed his potential landing spots from the plethora of teams that reached out to him at the beginning of the free agent interview period. If the Sabres can convince Hutton to sign with them, he’d be bringing along the .931 save percentage he posted last season in 32 games. Custance believes that’s enough to land him a three-year deal on the open market. That would be the longest contract of his career, and at the age of 32 perhaps his last multi-year deal. Hutton was a classic late bloomer that had to work his way through the NCAA and minor league ranks before making his NHL debut at 27, but has stolen the limelight twice in his career as Pekka Rinne and now Jake Allen struggled. His career .915 save percentage would actually match Lehner’s, but he might come in at a lower price tag than the latter’s qualifying offer would have guaranteed. Buffalo, armed with new superstar prospect Rasmus Dahlin and some Stanley Cup-winning talent are trying to compete for the playoffs this season. Ullmark has showed immense potential and could step into a full-time starting role right away, but there’s no harm in pairing him up with one of the best options on the market. With Game 5 of the Eastern Conference Finals approaching in a few hours and deadlocked at 2-2, the Washington Capitals will make a few lineup changes, according to NHL.com’s Tom Gulitti. The scribe writes that head coach Barry Trotz said he intends to return center Nicklas Backstrom to his second line to join T.J. Oshie and Chandler Stephenson. Backstrom, who finally returned for Game 4 against the Tampa Bay Lightning, played well in his return after a four-game absence. While he didn’t score any points, he played 18:51 of ice time and won six of nine faceoff attempts. Gulitti also reported that Trotz said he will switch out Andre Burakovsky with the bigger, more physical Alex Chiasson on the team’s fourth line. Burakovsky has been back for four games after missing time with an injury. However, in those four games, he’s failed to score a point and only has had two shots on goal. In the last two games, he’s played just 7:26 and 8:30, respectively. Chiasson has one assist in three playoff games against the Lightning. The Buffalo News’ Mike Harrington writes that the prevailing belief is that the Buffalo Sabres do not have a No. 1 goalie within their organization, meaning the team will have to find one through free agency or via trade to join Linus Ullmark. Harrington writes its very likely the team has seen the last of Robin Lehner and Chad Johnson, last year’s goalie tandem. The 26-year-old Lehner will be a restricted free agent and is not expected to receive an offer, while Johnson will be unrestricted. After New Jersey Devils goaltender Cory Schneider listed his New Jersey house on the market recently, there was some speculation that he might be moving on, but NJ.com’s Chris Ryan writes that he’s not going anywhere as he’s just buying another house in the area. A career dominating goaltender, Schneider has struggled the past two years due to poor team defense and injuries. After putting up a 2.82 GAA and a .908 save percentage in the 2016-17 season and a 2.93 GAA and a .907 save percentage in the 2017-18 season, Schneider underwent surgery to repair cartilage in his left hip and is expected to miss training camp and possibly the start of the season. The 32-year-old has four years remaining on his deal at $6MM AAV. The Sabres have yet to hold any contract talks with pending restricted free agent forward Sam Reinhart, reports Bill Hoppe of the Olean Times Herald. The 22-year-old caught fire in the second half of this season and as a result, he posted career highs in goals (25) and points (50) and will be set to earn a considerable raise on his next contract. Speaking with reporters at a news conference, GM Jason Botterill acknowledged that their situation in the standings played a role in their decision to put off contract talks until after the year, a decision that might cost them a bit given the way Reinhart ended his season. Botterill also confirmed that head coach Phil Housley will return for 2018-19 and that goaltender Linus Ullmark will be one of the Sabres’ goaltenders next season, meaning that at least one of Robin Lehner and Chad Johnson will be heading elsewhere. Among the many topics discussed at the Senators’ end-of-season press conference was the upcoming draft. GM Pierre Dorion told reporters, including Postmedia’s Bruce Garrioch, that the team intends to keep their first-round pick this year and not transfer it to Colorado. As a result, the Avalanche will acquire Ottawa’s unprotected first-round selection for 2019. Because they finished 30th overall in the standings, the Senators can pick no worse than fifth overall in June; the draft lottery is set to be held on Saturday, April 28th. The Panthers plan to be selective in unrestricted free agency, GM Dale Tallon told Barry Jackson of the Miami Herald. Tallon wouldn’t go as far as saying that they won’t be buyers on the open market but he was quick to caution that they don’t want to take away playing and development time from their young core of players either. Florida has just over $65MM committed to 19 players for next season per CapFriendly with no restricted free agents in need of big raises so they will have some wiggle room to work with if they can find the right fit. Buffalo Sabres GM Jason Botterill took the podium today for the team’s season-ending press conference, and spoke on several topics including the future of Phil Housley—who, not unexpectedly, will be back next season—and the comments made by players like Ryan O’Reilly. Admitting that things need to change drastically right down to the culture of the team, he also touched on a goaltending situation that remains in flux. Botterill announced that he is excited to have Linus Ullmark as one of the NHL goaltenders next season, but couldn’t say at this point who would be paired with him. That’s partly because of the free agent situation both current netminders find themselves in, but likely also because of the disappointing season that preceded the presser. Chad Johnson is an unrestricted free agent come July 1st, and after posting an .891 save percentage this season is unlikely to return for the Sabres. Though Johnson has posted fine numbers in the past, pairing him with the relatively inexperienced Ullmark seems like a recipe for disaster. He’ll be 32 in 2018-19, and looked lost in the net at some points this season. More likely—but perhaps only barely—is the return of Robin Lehner. After using a first-round pick to acquire him from the Ottawa Senators, Lehner actually put up two very strong seasons behind lackluster teams in 2015-17. Posting save percentages of .924 (albeit in a small sample) and .920, he looked like he truly could be a long-term option in Buffalo. There were some questions about his consistency though, as the emotional goaltender could sometimes get in his own way. Those inconsistencies were the story this season, as his numbers dropped across the board and led to questions about his future. Lehner will be a restricted free agent this summer, but is coming off a $4MM salary this season. That means his qualifying offer would need to be at least that much, something the Sabres might not feel accurately portrays his value. If Ullmark is given the keys to the club and is expected to handle at least a good chunk of the starting duties, it’s not clear if Lehner would be re-signed or moved. If he is put up for trade, there are certainly clubs that would be interested. As stated above, Lehner clearly has the talent to be an above-average goaltender in the NHL. Put on a stronger team, with a healthy leadership core, perhaps the best of him would come out once again. Still only 26, there is even room for him to grow as a professional and squeeze out some of the inconsistency from his game.